I wasn’t going to get involved…much. We’re focusing on #2 today. Several states have enacted similar laws over the last 5 years, and some (like California) went on to remove exemptions completely. We will not let that happen. Oh, no. I won’t be silenced. It is ON. Back to my objections over HB559. Requiring a doctor’s note to exercise your rights is problematic in several ways. First and foremost, doctors are not authority figures. They do not have any right to give families “permission” to make their own decisions. Under ideal circumstances, families and doctors partner for health care, with doctors giving expert opinions and advice, and families ultimately making their own decisions. It’s called informed consent. Unfortunately, none of this is true. (See this for more.) It’s not at all an accurate picture of the risks and benefits of vaccines, or of the diseases they’re designed to prevent. Some doctors even deny that reactions are possible, and deny reactions that occur right in front of them, because they’ve been taught “vaccines can’t cause that.” (Not to mention they call thousands upon thousands of parents liars when they report reactions.) What if parents visit these doctors and are bullied over their decision? There is no provision for parents to see an alternative practitioner outside of Western medicine, who may be more likely to agree with the parents’ beliefs. Western medicine is not the only system available and this is not acceptable. Some families may not have an existing relationship with a doctor. Some may have doctors who do not agree with skipping vaccines who will refuse to sign the paper. What happens if these families live in rural areas (which a good portion of Ohioans do) and cannot access a doctor who will sign? Many will not be able to travel an hour or two into a larger area to find a doctor who will sign it. Are they just unable to exercise their rights? This will disproportionately affect families who are low-income or in rural areas — although these families are already at a disadvantage because they have less access to information about their rights. Many do not know they can opt out today. As I just mentioned, many families do not know they can opt out. A lot have been told “these shots are required for school attendance,” with no mention of existing exemptions. Many parents have vaccinated reluctantly, believing there is no other option. If the laws are tightened, schools may be even more likely to deny exemptions, or to say “You have to go to a doctor to get permission for that,” which makes it seem scarier to use. The country in general has not succeeded in scaring parents into vaccinating, so they have decided to try forcing it by making it harder to exercise their rights. It reminds me of an old Berenstain Bear book, where the principal kept changing the rules and making them tougher and more specific in an attempt to control the students. It didn’t work and everyone was miserable. The state has no right to make medical decisions for anyone, nor to bully or coerce people into making certain decisions. They couldn’t educate people into it, they couldn’t scare people into it, so they’re trying to change laws to force people into it. And that is very, very wrong. The CEO of the Ohio AAP has been very public in this fight. She wants HB559 to pass, and has used her personal profile to call out “anti-vaxxers” as liars and bullies, among other things. Naturally, the community opposing HB559 is not happy about being portrayed in such a manner. Most (obviously, not all) have gone out of their way to be professional and respectful. They have posted respectfully on the public AAP page about their dissension (comments are deleted and people banned) and have prepared and shared testimony at the statehouse, and have appeared in red shirts to oppose the bill. In fact, they were present on Wednesday, 5/23, to give testimony in opposition to the bill. Almost all the reps left when it was their turn, and several of the ones who stay actively laughed at the parents or looked bored and seemed not to be listening. (Rep. Steven Huffman in particular was caught laughing.) This is unacceptable behavior from government officials. When I posted a respectful comment to the AAP’s page, urging them to reconsider this bill, examine the new science surrounding vaccines, and protect families’ rights, the entire post was deleted. She is the head of a professional organization that is leading the fight against our rights. Her business email address is the only thing that was shared. She is politically active and this is a serious issue for many of us. We have the right to share what is happening in order to fight for our rights. Fortunately, I have a large community…so I will not be silenced. All they’ve done is motivate me to use that community to fight against this ridiculous bill and the unprofessional organization pushing it. If the AAP were really about health and families, they wouldn’t be deleting posts and comments that opposed them, and they wouldn’t be trying to shut down opposition. This is about our rights. It’s time to take action, whether or not you are in Ohio. If you’ve had enough of the mainstream medical system bullying families, attempting to take their rights, acting like they are an authority figure in families’ lives, it’s time to stand up and fight back. Step 1: Find your state representative and email him/her (politely!) to oppose this bill. You can find your reps HERE. Give specific reasons why you oppose it, and share a personal story if vaccines have affected you or your family. Step 2: Write to the Ohio AAP (HERE) staff and board of directors, sharing recent studies with them, your personal story (if you have one), and urging them to take this seriously and oppose this bill. Step 1: Share this post. Make it go viral across social media, so that everyone sees what we’re up against here. 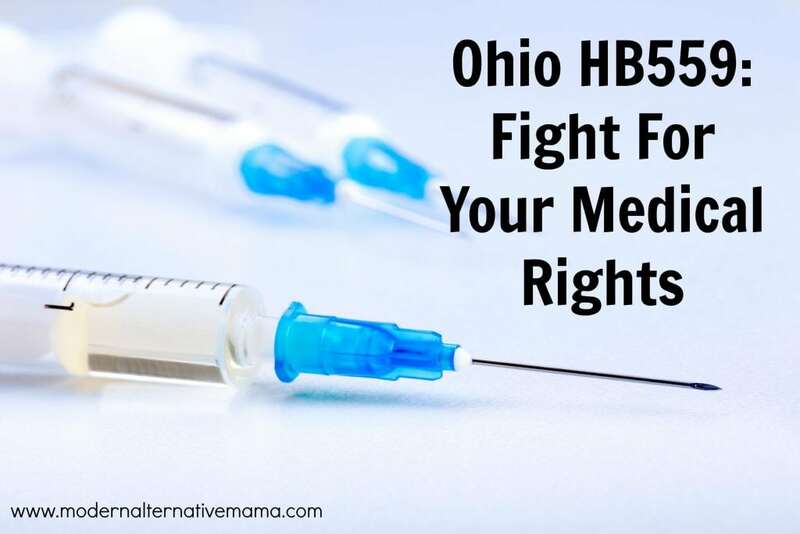 Step 2: Contact the Ohio AAP to (respectfully) express your displeasure at this bill and the way they are treating Ohio families, and urge them to withdraw the bill. Step 3: Check your own state’s current bills, to see if any action is required in your area. This is not about vaccines. It is about our rights to make our own medical decisions, without fear of retribution from the medical community, and without fear that our children cannot access public education. This is for families who don’t vaccinate at all, families who partially vaccinate, and families who fully vaccinate, but still want to retain the right to decide what to do for themselves. Politicians and doctors (at least, some doctors and organizations) have been slowly creeping on families’ rights for several years now…and it’s time to say, NO MORE. Get involved now. Fight for your rights. Organize as a community and show the government what matters! Have you been fighting HB559? Did you know about it? It’s a spiritual battle. The father of lies is at work. We also need to mobilise prayer warriors to protect our children. Your post is excellent and very clear. Thank you. Thanks for sharing, Kate! I posted this article on fb along with a chunk of it in a comment…we’ll see how long it stays up! Thank you for spreading awareness about this terrible bill. NVIC is opposed to this bill too and people can see the analysis and action items on http://NVICAdvocacy.org on the Ohio State Team Page. Thank you for standing up about this and making a stand. I’m in California where it’s sadly too late… thank god for home schooling! I’m the VP and PR chair for Ohio Advocates for Medical Freedom! Thankyou for raising awareness on this issue!!! We are bound and determined to FIGHT this bill every step of the way, despite their attempts to silence us! We will continue to post updates on our FB as we have them! All excellet points. Even if you are not philosophically or religiously opposed to vaccination, there may be ones you do not want. This opens parents up to be bullied or pressured into whatever new vaccine that comes down the pike and gets slapped onto the schedule. Thank YOU for speaking up and for standing up to protect our children. I don’t live in Ohio, but you are so rocking… This is great information for all to be aware of no matter where we live. I hope even more will join in to help fight this of so many battles, especially when it comes to our kids.